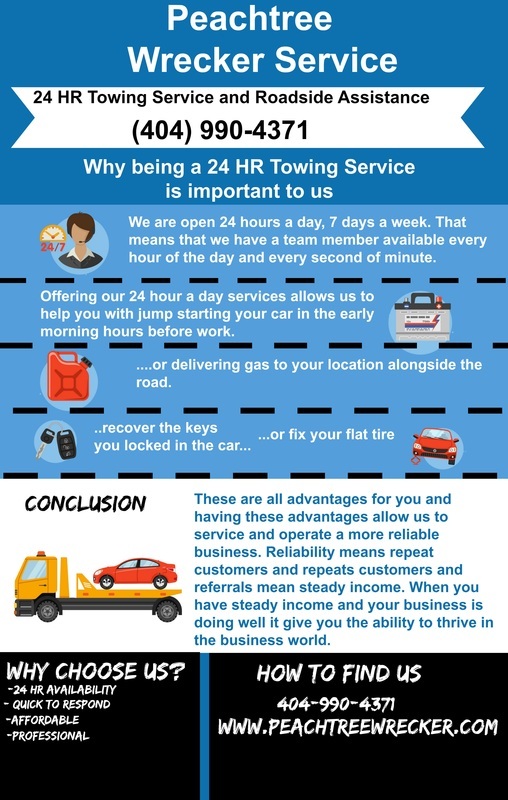 Why 24/7 Hr Towing Service and Roadside Assistace? Why offer 24/7 towing service? We are open 24 hours a day, 7 days a week. That means that we have a team member available every hour and every second of minute. This is an advantage in the tow service industry because we are able to serv and offer great solutions to our clients any time day or night. In the case of an emergency we are always able to help. Emergencies typically don’t happen during the business hours, they happen in the middle of the night or early in the morning, but that is not to say that from time to time they don’t. Our professionals are reliable, offering our 24/7 services allows us to help you with jump starting your car in the early morning hours before work or delivering gas to your location alongside the road. Being open 24 hr a day 7 days a week allows us to service our customers when they need us most. ​ These are all advantages for the customer and having these advantages allow you to service and operate a more reliable business. Reliability means repeat customers and repeats customers and referrals mean steady income. When you have steady income and your company is doing well it give you the ability to thrive in the business world.